Review "This isn't just an upgrade of the browser. It's also an upgrade for the web", says Mike Beltzner, Firefox product director, in his What's New in 3.5 video. Hyperbole for sure, but it highlights the most interesting aspect of the browser wars, which is how each player is trying to influence the direction of web development. From the user's perspective, Firefox 3.5 is better - but not dramatically so. The first notable new feature is private browsing, a catch-up with Microsoft's Internet Explorer and Google Chrome that lets you browse web sites without leaving traces in browser history or temporary files. Next comes Tear Off Tabs, which - as in Apple's Safari - allows tabs to be dragged into a separate browser window. A neat touch is Recently Closed Tabs and Recently Closed Windows, which gets you back where you were after accidentally closing a page. Location-aware browsing is more exciting. 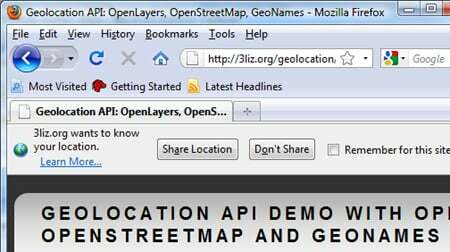 A website can prompt for your location, and subject to your consent, Firefox will call a Google API to work out where you are. It implements a proposed W3C standard and has potential, though hardly any sites make use of it at the moment. The other snag is that Firefox currently relies on WiFi points and IP addresses and does not use GPS even if present. Which may explain why it was out by 125 miles when I tried it. Firefox scores well against its rivals in memory usage. IE8 and Chrome use a new process for each tab, which eats memory. Informal tests suggest that Firefox uses less RAM even with just one page open, and its advantage grows as further tabs are opened. In a quick informal test, Firefox used about the same RAM as Safari. Only Opera was slimmer. In this respect, Firefox 3.5 is more a statement of intent than a realistic alternative to Flash. The audio element only supports Ogg Vorbis or uncompressed wave audio, while video is limited to Ogg Theora. Adobe's Flash, by contrast, offers a consistent cross-browser runtime, integrated with its Creative Suite design tools that are used everywhere. It may be hard to convince Microsoft to implement standards that compete with Silverlight in IE. Still, it is a significant statement of intent, and a few years from now Adobe's hold on web multimedia may be less secure. Another key question is whether Google, Mozilla, and Apple can avoid fragmentation of evolving standards. Google's Gears extension overlaps with much of what is in HTML 5.0, but has its own specification. Features like local SQL support are different in Safari and Chrome and not present at all in Firefox except for extensions. When he worked at Google, Mozilla's Dion Almaer argued that: "HTML 5 and Gears will converge in the not too distant path." They need to. Otherwise, both will be undermined.